The Miami Dolphins are reportedly looking to make a splash in free agency. Los Angeles Chargers linebacker Melvin Ingram is that splash. The Miami Dolphins under owner Stephen Ross and executive VP of football operations Mike Tannenbaum haven’t been shy about spending money in free agency in recent years. Those splashes have come with mixed results. Ndamukong Suh, signed by the team in 2015, paid off big time with two very good years since joining the club. Other Miami Dolphins free agency splashes like Mike Wallace? Not so much. The Dolphins are once again in the market to make a splash in free agency, as reported by NFL.com’s Ian Rappaport. The team has a few major holes on both sides of the ball. Especially with the reported trade of left tackle Branden Albert. Who should the Dolphins “splash” target be in this year’s free agent class? 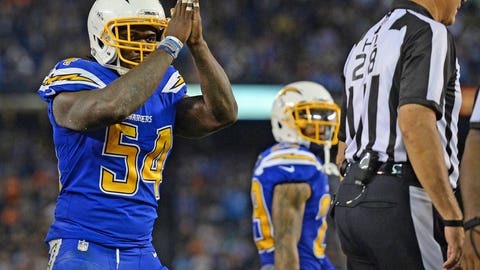 I say it should be Los Angeles Chargers edge rusher Melvin Ingram. Ingram came to the now Chargers as the 18th pick in the 2012 NFL Draft. His career did not get off to a great start with the Chargers. Plagued by injuries in his first three seasons, Ingram only started 12 games, logging a paltry six sacks and mediocre tackle numbers. That was then. In the last two seasons Ingram has really come into his own. He’s become one of the premier edge-rushing talents in the game to the tune of 18.5 sacks and 98 tackles combined in 2015-16. That isn’t all. Ingram, unlike many of his counterparts at the position, displays the cover skills to drop into coverage like a traditional outside linebacker. That combination of dominance on the edge and versatility in pass defense has made Ingram the most sought-after free agent this year. Pro Football Focus has named him the No. 5 target of likely free agents this year. Whether you put any stock in PFF or not, one thing is certain: Ingram is going to get paid. Very well. Just how well remains to be seen and will be a real sticking point for some teams. If the price is right, the Miami Dolphins should pull the trigger. The Miami Dolphins have always been a team built upon solid defense. Going back to the beginnings of the franchise, the defense has usually been the backbone. The current edition of the team, however, is in some pretty dire straits on that side of the ball—particularly in the front seven. Cameron Wake is coming of a year that is nothing short of absurd, especially given his age and the fact he was recovering from a truly serious injury. Suh, for as much criticism as he takes for his contract, is still one of the best defensive tackles in the league. Beyond those two, however, the talent quickly deteriorates. If the Dolphins don’t re-sign potential free agent defensive end Andre Branch, they’ll be left with only Terrence Fede at the position. Adding Ingram to the mix at the position would immediately give the Dolphins a ton of talent and flexibility in how to build out the line. They would be able to free up a draft pick for another position of need. Perhaps an offensive lineman would make sense, as the Albert trade leaves them with two holes up front. Ingram would also provide another man in the rotation to keep Wake fresher. However, the biggest boon to signing Ingram would be what he does for the linebacker corps. The 2016 group was one of the worst in franchise history. Injuries did play their part in the group’s poor performance, but the talent needs to be improved. Ingram would provide an immediate talent upgrade. Primarily thought of as a pass rusher—for good reason—Ingram’s coverage skills shouldn’t be overlooked. He is more than capable in coverage and holds his own against a tight end or a running back. Covering tight ends was a massive issue for the Dolphins last season, particularly down the stretch. Opposing tight ends like Dennis Pitta and Charles Clay had field days late while matched up on the Dolphins linebackers. Of course, there are two sides to every story. There are reasons why the Dolphins could, and perhaps should, hesitate to shell out the money it’s going to take to put Ingram in aqua and orange. The primary concern, being that he’s not exactly a great fit for the Dolphins defensive scheme. The Dolphins run a 4-3 base defense. Ingram’s best fit is probably as a 3-4 outside linebacker where he can use his pass-rushing abilities to their full potential. That being said, “fit” is a bit overrated, particularly when it comes to this position. In today’s NFL defenses are in a nickel or dime package well over 50 percent of the time, per CBS Sports. Ingram would be on the field more often than not, and has the ability to thrive in either role he may be asked to perform. The biggest hurdle as far as the team and Ingram are concerned is most likely going to come down to money. What are the Dolphins willing to offer Ingram vs. how much below expectations Ingram is willing to go? Ingram is likely looking for a contract in the neighborhood of the one former Dolphin Olivier Vernon received from the Giants. I don’t think he’s going to get that much, but he’s going to get paid handsomely. Vernon is scheduled to make $16 million in 2017. If Ingram is willing to take something in the neighborhood of $12-13 million, I think the two sides can come together and make it work. That’s a lot of money for a linebacker, but to the Dolphin’s front office the splash may be worth it.